This charming quintessential Cape Cod Cottage is nestled among the pines and oaks toward the back of the 11 cottage compound. Many of the cottage comforts include a fully equipped kitchen with a stove, full size refrigerator, pots , pans and utensils, new microwave, new coffee maker and new toaster. The living area has a new futon coach with a TV ,VCR, and a new stereo CD player. The cottage also has a private bedroom and private bath with an additional outdoor shower perfect after a day at the beach. Outside the cottage you will find a private backyard complete with a charcoal grill and picnic table. 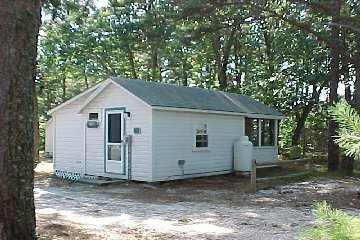 The cottage is conveniently located just minutes to both bay and ocean beaches as well as Wellfleet's many sparkling kettle ponds. Wellfleet is also known for its many art galleries and its drive in theater. For your additional enjoyment within minutes you can find many restaurants, tennis , a golf course, bike trails ,mini golf plus much more for your Cape Cod get away. Blankets and pillows are provided. You must bring your own towels and linens. Toiletries: No toiletries are provided. Bring what you need. The cabin will be clean when you arrive. You must do your own cleaning during your stay and prior to your departure. Smoking: Absolutely no smoking inside the cabin! Pets: Sorry! Unfortunately no pets! Summer Season: The season begins the last week of June and runs through the end of the first week of September. Full week rentals only, from Sunday afternoon (check in 2 pm)through Sunday morning (check out 10 am). Off Season: All Spring and Fall. Rentals generally run from Sunday to Sunday, but partial week rentals may be negotiated. Copyright@2005 Brownies Cabin Condominium Trust, All rights reserved.